Located at the base of the Ouachita Mountain and along the Little Missouri River, this park is a perfect one for both hikers and kayakers, alike. Hiking can be accomplished along the Daisy creek hiking trial, while the kayaking can take place on Lake Greeson. That apart, fishing and playing grounds are a plenty around the campgrounds here. Camping rates start as low as $10. If you are one of those people who like to camp in comfort, then Catherine’s landing is the right place. It is famous for its climate-controlled ‘yurts’ that one can rent and enjoy. There are also RV camping sites and some resort cottages available for those who desire the comfort of their own space. Hiking, swimming, fishing and sightseeing are the favorite indulgences of people who choose to camp in this forest. One can opt for a completely primitive camping experience or the regular cabins available for rent in the forest. Do not miss the Haw Creek falls, a star attraction of this camping destination. This is a camping destination befitting an outdoor activity enthusiast. From rock climbing to rappelling and horse riding to mountain biking, this park has something for everyone. One can choose to pitch their tent or rent a cabin or lodge depending on the level of comfort desired. Overlooking the Arkansas river valley, this small state park has about 34 campsites. It is an excellent destination for those who love hiking. There are 14 miles of hiking trails around the mountain. The park has all modern amenities while providing ground for adventures such hand gliding and mountain biking. Located close to the Cedar Valley Township, this scenic park is the easiest to approach. 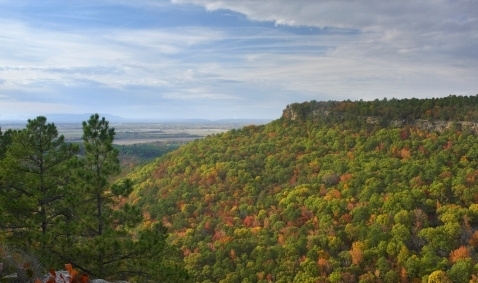 Its proximity to the city makes it an ideal weekend destination for those living in Arkansas. One can go hands free and rent a tent, tepee or a cabin according to the requirement. Replete with beautiful views, this state park has biking and hiking trails and numerous waterfalls for the scenery lovers. It has great historic sites within its confines and is ideal for outdoor adventures. One of the most popular camping grounds in this forest is the Long Pool that has 41 campsites. Being situated along the Big Piney River, this camping ground entertains water sports lovers the most. It also has a number of trails for the hiking and biking lovers. For the more adventurous kind, it also has ATV trails. Campers who visit this place love to do so for its hot springs, living caves and fishing spots. Of special mention is the Gunner Pool that is a hot favorite for those who like to swim in springs. Waterfalls, creeks and hiking trails make this the hot spot for campers. This spot is the best of the 10 listed so far and is aptly called the Lost Valley.